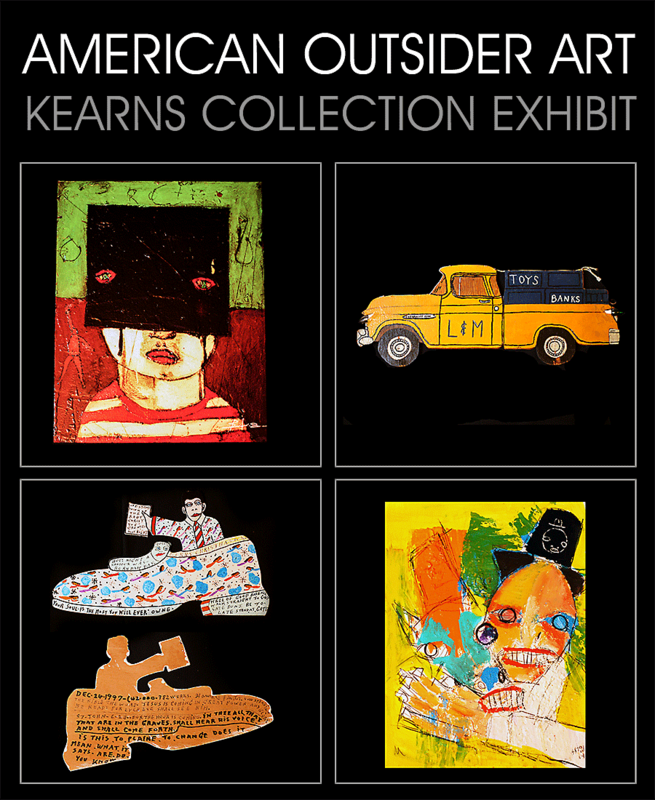 This winter, Geezer Gallery is excited to have the privilege to display the expansive, lifelong Outsider Art collection of Jane and David Kearns. This specialty exhibit provides a visual illustration of historical elements rooted back to the Civil War era, working to both illuminate a comprehensive story of American culture as well as to expand the idea of what it means for a piece to exist within the art community. Highly collectible and admired, Outsider Art breaks the mold of the artistic establishment. With minimal contact to the mainstream art world, outsider artists’ drive to create is unstoppable. Using unconventional materials such as sugar mud, roofing tar, and house paint as well as styles unadulterated by artistic culture, these artists produce one of a kind pieces portraying the inner workings of their psyches. They feel that their experiences and messages must be heard, using creation as a form of communication and therapy. Stemming from each piece is a gripping story that will surely capture the heart and mind of its viewers. Working with collectors Jane and David Kearns, Geezer Gallery has discovered the secrets behind these captivating windows into American history. Known by other names such as Art Brut or ‘Raw Art,’ Outsider Art falls into many categories such as the art of the mentally ill, tramp art, prison art, and folk art. Each of these groups faces disadvantages that bring about stigmatization, but this does not hinder their artistic pursuits. Currently displayed in reputable institutions such as the American Museum of Folk Art, the Smithsonian National Museum of American Art, as well as in galleries around the world, Outsider Art has become a highly valued genre. For more information call (503) 347-0734 or email contact@geezergallery.com. Categories: Artists Repertory Theatre, Exhibitions | Tags: Outsider Art | Permalink.